Referee Xavier Estrada Fernandez had his work cut out in the Madrid derby at the Estadio Wanda Metropolitano on Saturday, with as many as six moments provoking debate. Here, we take a look at each of these incidents. 1. Did Correa foul Vinicius before Griezmann’s goal? Antoine Griezmann equalised for Atletico in the 25th minute, but VAR was needed to confirm that he was onside. 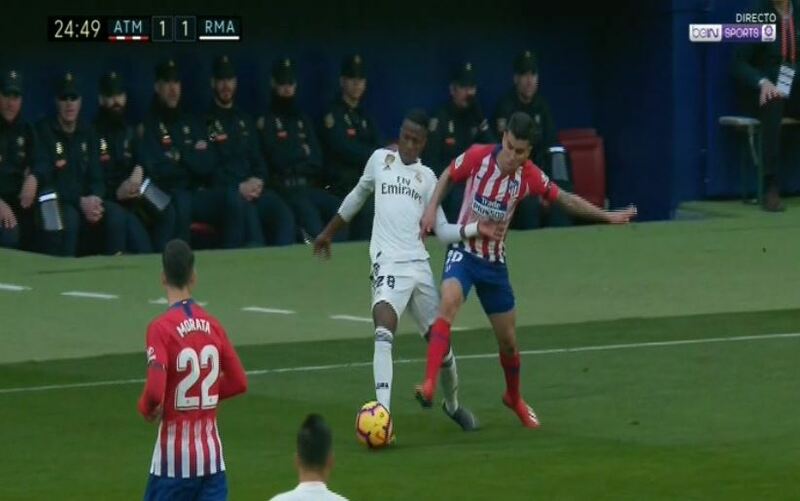 Yet Real Madrid still complained that a foul was committed by Angel Correa on Vinicius in the build-up. 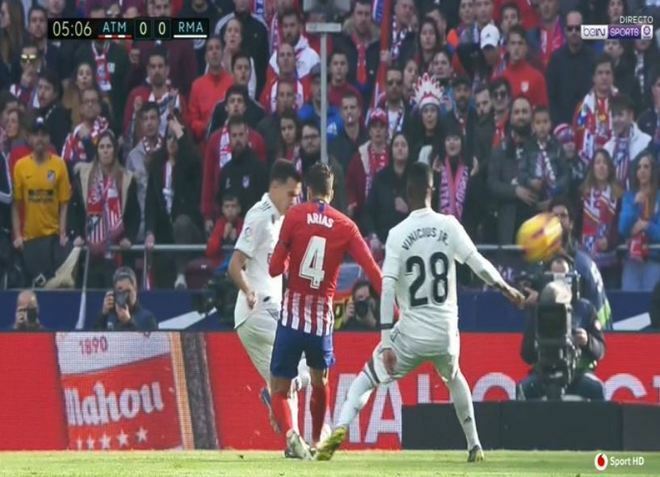 “The goal should not have stood because there was a foul by Correa on Vinicius near the centre of the field,” refereeing expert Andujar Oliver said on Radio MARCA. 2. Was Gimenez’s foul on Vinicius inside or outside the box? 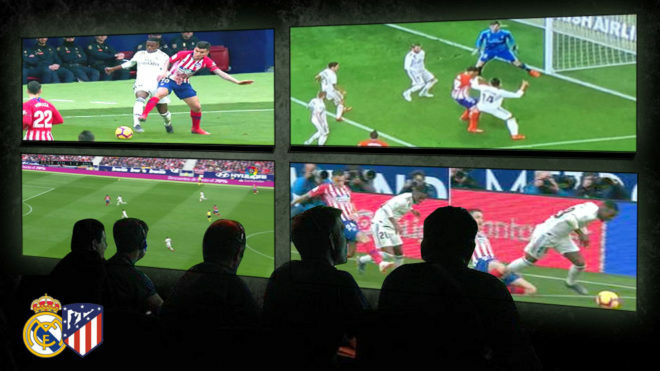 Just before the break, in the 40th minute, Jose Maria Gimenez brought down Vinicius and Atleti were adamant that the challenge was outside of the box. “The piece of play is very controversial and doubtful, but my assessment is that the foul of Gimenez on Vinicius takes place outside of the area,” Oliver told Radio MARCA. 3. Did Casemiro foul Morata? In minute 66, Casemiro appeared to push Alvaro Morata and Atletico players claimed for a penalty. “The image shows us Casemiro bringing down Morata,” Andujar Oliver said. “He puts out a leg and takes him down. Casemiro, though, had a different view. “For me there was contact, but it’s not a penalty as for that there has to be more,” Casemiro said after the game. 4. Was Morata offside for his disallowed goal? In the 54th minute Morata raced through and lobbed Thibaut Courtois, but it was ruled out for offside by inches. 5. Should Arias have been booked or sent off for fouling Reguilon? Only five minutes in, Santiago Arias appeared to stamp on Sergio Reguilon. Yet only a foul was awarded by the referee. 6. Was it the right call to send off Thomas Partey? In the 80th minute Thomas Partey saw a second yellow for a hard challenge on Toni Kroos‘ foot, having been booked earlier for bringing down Reguilon. He walked off without complaining.